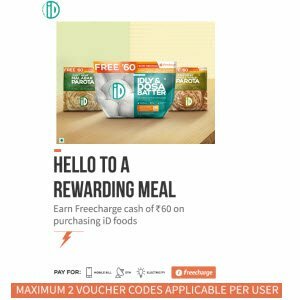 Freecharge Id Food pack offer is offering Free Rs. 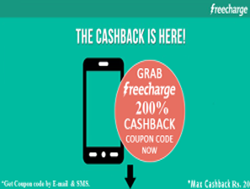 60 freecharge Fund code or Cash.Just Buy food pack and get Free cash.You get this freefund code on purchase every id food pack.This offer is valid till 30 august 2016.Hurry up and get this loot without any delay.On purchasing one pack you get Voucher just login and apply your code and you get Freecharge cash instantly without waiting Single minute. Also One User can Use this code Two times.So You can loot Rs. 60 in one account by this offer.How to get this offer :- Follow steps. Freecharge id food pack offer Updates :- Offer is available only on id Idly Dosa batter 1 Kg , Malabar Parota 400gm , Whole Wheat Parota 400gm. Firstly Buy Id food pack from your Nearest store. You get Freecharge code inside the pack. Visit Freecharge or Download Freecharge Android app. If you previously Installed this app then update it. Now goto Menu> Click on Reward option.> Freecash With Id. Now enter your code which you get in pack. Done ! You get Rs. 60 Freecharge Cash. Use it anywhere in India By freecharge go mastercard.Or use it for recharge , Pay bills etc. 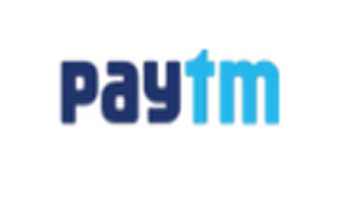 You can use Freecharge cash for Recharge / Paying Bills / Etc. Offer is valid on official site (Desktop , mobile ) or android app. Valid Till 31st august 2016. Validity of this freecharge Cash is 185 Days From the date of credit. This cash is non Transferable. Not valid on IOS and Windows app. 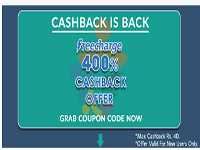 Freecharge anytime Close this Offer without Any prior Notice. Freecharge holds the right to refuse transactions deemed fraudulent as per Freecharge policy. Tags:- Freecharge id food pack offer, Freecharge id Food Rs 60 Recharge offers & coupons, Freecharge id food pack Rs 60 Recharge, Freecharge Rs 60 Recharge.